SL Prime Minister Ranil Wickramasinghe has instructed the military intelligence of genocidal Sri Lanka to select 20 persons among the 10,000 enslaved former LTTE members, who are employed as slave workers at SL military-run farms, to be dispatched to Geneva in March to confront the Tamil activists at the side-events of the Human Rights Council sessions in Geneva, informed circles in Jaffna said. 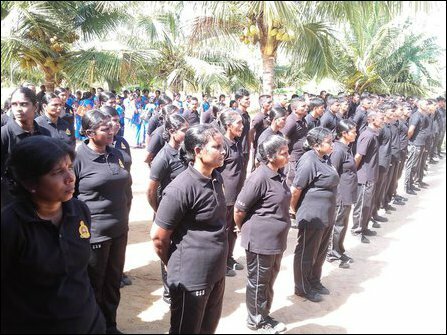 While the former LTTE members, employed as slave workers under the so-called Civil Security Department (CSD) are being systematically deprived of independent livelihood, the hand-picked ex-LTTE members are being trained to project a positive image of the enslavement as ‘reconciliation’. The Tamil CSD ‘personnel’ have been forced to sing ‘Sri Lanka’ anthem in Sinhala at various events as documented last year at Poonakari on the so-called ‘independence day’. The CSD ‘workers’ are primarily employed in military-run farms in Vanni and are transported to and from the occupied ‘High Security Zones’ for employment in farms run by the SL military in Jaffna. They have also been forced to work as informant operatives. A section of them have been subjected to sexual exploitation by the occupying SL military. In 2011, the British government was in the forefront in leaving the 'reintegration' of the 'rehabilitated' former Tamil combatants in the hands of the genocidal military. For this purpose, the Establishment in London provided 90 million rupees, coming from the UK's 'Conflict Pool'. The International Organisation for Migration (IOM) of questionable credibility was also involved in the process. In this connection, accompanied by genocidal Sri Lanka's military, the then British Deputy High Commissioner in Colombo, Mark Gooding, visited a military-run camp for ex-LTTE combatants. Almost 10,000 Eezham Tamil captives subjected to so-called ‘military rehabilitation’ continue to be under SL military control as paid slave workers in the agricultural farms run by the military. They are given black uniforms where the letters, CSD, are written in white. SL military is also running ‘pre-schools’ for the families of enslaved Eezham Tamils. The teachers, children and CSD slaves are paraded at some military events with instructions to sing SL anthem in Sinhala language, as exposed last year on the so-called Independence Day on February 04. The preschool teachers are instructed to wear a blue uniform. 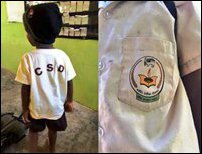 The genocidal military has also experimented with a different uniform to preschool children in the past, forcing them to wear white shirts with black CSD letters. Colombo has already come under severe criticism from the Northern Provincial Council for refusing to hand over CSD operated pre-schools in Vanni to civil authorities. However, the entire CSD enslavement is being projected as ‘development’ and as ‘reconciliation’ to the outside world while the entire scheme has been structurally embedded into a genocidal paradigm. In the meantime, UN Rights Chief was projecting Colombo ‘allowing’ Tamils to sing the so-called national anthem of genocidal ‘Sri Lanka’ in Tamil last year. 04.07.16 Gaining more ‘time and space’ at Geneva, Colombo steps up ge..
05.02.16 Enslaved Tamil fighters forced to sing ‘Sri Lanka’ anthem in..
19.04.14 CSD operative in Vanni detained for murder of woman from Mat..
07.10.17 Colombo brings Sinhala private partnerships to wag..
13.06.17 SL military-run preschool children in Vanni forced..
07.02.17 Genocidal Colombo to dispatch ex-LTTE members to G..
08.05.16 SL Governor condemned for justifying military-run ..